Elderberries (Sambucus nigra) are a fantastic home remedy for colds and flu and are backed by both science and traditional use. 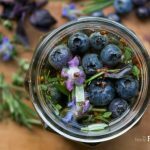 They’re often turned into a sweet and tasty syrup, like my homemade elderberry syrup made with honey, but can also be preserved and dosed in other ways, including this elderberry tincture. I chose to add a handful of herbs to my elderberry tincture to give it an added antiviral boost, but they’re completely optional. Organic dried elderberries can be purchased from Mountain Rose Herbs. Fill the jar about 1/4 of the way, if using dried elderberries, or 1/2 of the way if using fresh berries. Add a few pinches of antiviral herbs, if you’d like. Add vodka to the jar until it’s almost filled to the top. 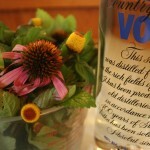 Use a chopstick or knife to gently stir and release any air bubbles; add more vodka if needed. Cover with a lid, label, and tuck in a dark cabinet for 4 to 6 weeks, or longer. 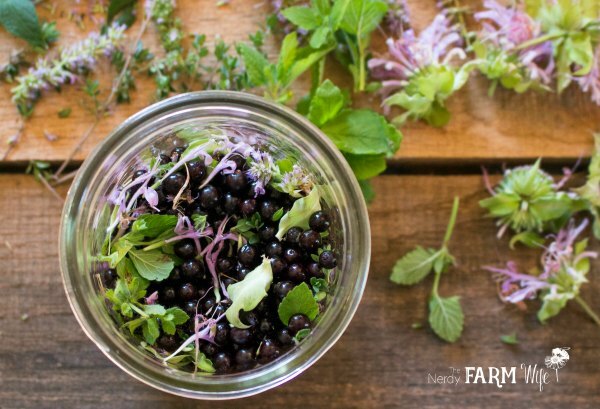 Strain and pour the elderberry infused liquid into glass jars or bottles. Shelf life is at least one year, or longer. 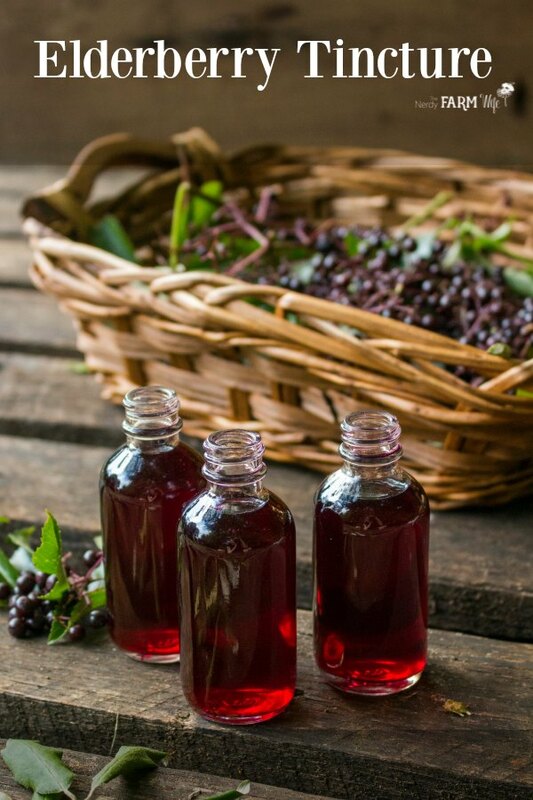 This varies depending on the size of the person, but a good starting point for an adult is 1/4 to 1/2 teaspoon (1.25 to 2.5 ml) elderberry tincture, taken several times per day. For my family, I mix a few drops into a spoonful of honey to make it pleasant to take. 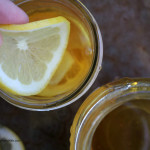 You could also add it to a hot tea, to help the alcohol evaporate, or try dropping a small amount into ginger ale. If you’re pregnant, nursing, on medication, or have any health concerns or questions, please consult a qualified health care provider before using herbal home remedies such as this one. 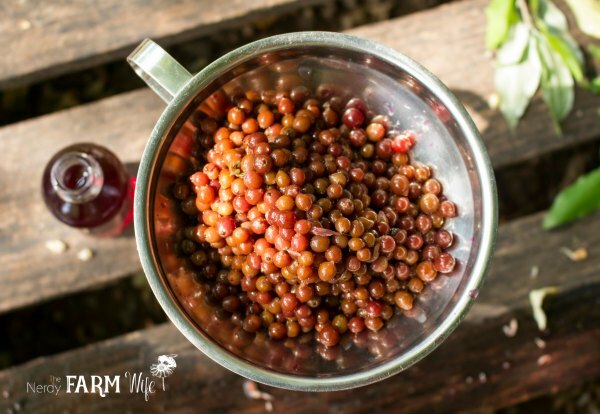 If you enjoyed learning how to make elderberry tincture, let’s keep in touch! 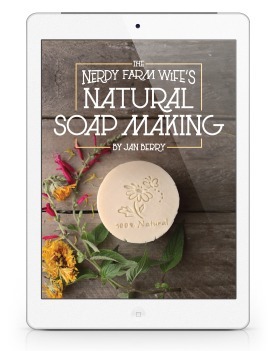 Subscribe to my newsletter and two to three times per month you’ll receive my latest herb & flower projects, natural soapmaking tutorials and DIY natural body care recipes. Could frozen elderberries be used in place of fresh? Also could the tincture be made with glycerin? Hi Kelly! Yes, you can use frozen elderberries. This sounds wonderful – I will make it as soon as I return home from vacation :). I love your blog – your recipes are wonderful. 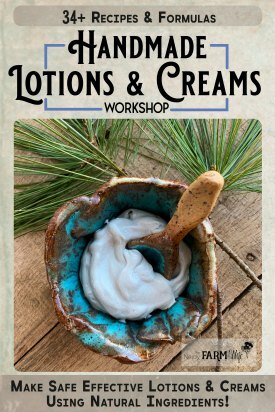 Thank you also for the soap mini-course – I’ll let you know how my first soap turns out soon! Since this wouldn’t be good for those under 21. Do you have a suitable recipe for young ones? You can totally use this for those under 21. It’s taken medicinally. 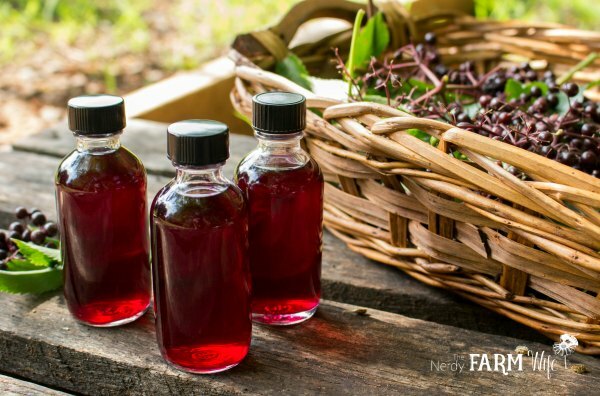 Do you find this to be equivalent to Elderberry syrup in preventing, fighting, and recovering from cold and flu? I like that a tincture is much more shelf stable then the syrup. Hi Bridgette! I like that you can dose the tincture in lower amounts & that it lasts longer, but I tend to favor the syrup most of the time. It’s probably more because it’s sweeter & I get better compliance from my family when I pull it out for them to take though!